A (mercifully) short review: Two newsletters back I told of my encounter with Alabama Sen. Jeff Sessions regarding the issue of Obama's citizenship, and I told of how he forbade me to write him a letter. In my last edition I published many of the letters I had received from readers in response. Today I would like to offer some comments to what readers have said. One reader suggested that Session's reluctance to take up the question of whether Obama is qualified to be President is because of a lack of courage. I am most reluctant to agree with this view because of my years-long admiration of Sen. Sessions and his great effectiveness in the illegal-immigration fight, and in other patriotic causes. However, for the sake of honesty I am compelled to report one bit of evidence in support of this hypothesis. In my discussion with the senator one thing that he said was, "You see what they did to Shelby, and he didn't really say anything." He was referring to Shelby's brief mention of the citizenship question in a town-hall meeting in Cullman, and his quick retreat under fire. Shelby's spokesman "clarified-away" his statement. Another reader voices the belief that the Supreme Court has decided that the case against Obama has no merit. This is wrong. The only thing that the Court has thus far decided is not to decide. Several cases have been dismissed without a full hearing, usually with the comment that the plaintiffs did not "have standing" to bring the case. But a number of fresh cases are pending. One reader echoed the belief of Jeff Sessions that Obama has released his birth certificate, that it shows him to be a native-born American, and that settles the question. I rate this as the most egregious of the false beliefs regarding the Obama citizenship question. But, just as Patton admired Rommel, I must humbly tip my hat to our enemies. Obama and his media allies have made a superb accomplishment in hoodwinking the public, and, apparently the intelligentsia. Their lies have penetrated even into the august chamber of the U. S. Senate, and been taken as credible there. The effectiveness of their propaganda would rival that of the late Dr. Goebbels of Third-Reich fame. First is the birth certificate of one of your old friends, namely mine. Below that you will see a genuine Hawaiian birth certificate. Finally you will see what purports to be the Obama birth certificate. And below that I will continue my comments. Above is Obama's "Birth Certificate"
Look at my birth certificate. It will be no surprise to see that I was "born alive," since how else could I be punching these keys? The certificate shows that I was, as was usual in those days, born at home. It calls for the signature of the "attending physician or midwife," and it was signed by C. M. Franklin, M. D. That would be venerable old "Doctor Charlie" who delivered most of the babies in town, including my mother. There were two other signatures, those of the Registrar, and of the State of Alabama certifying officer. A note on the face says that the certificate is valid only if it is imprinted with the seal of the state. 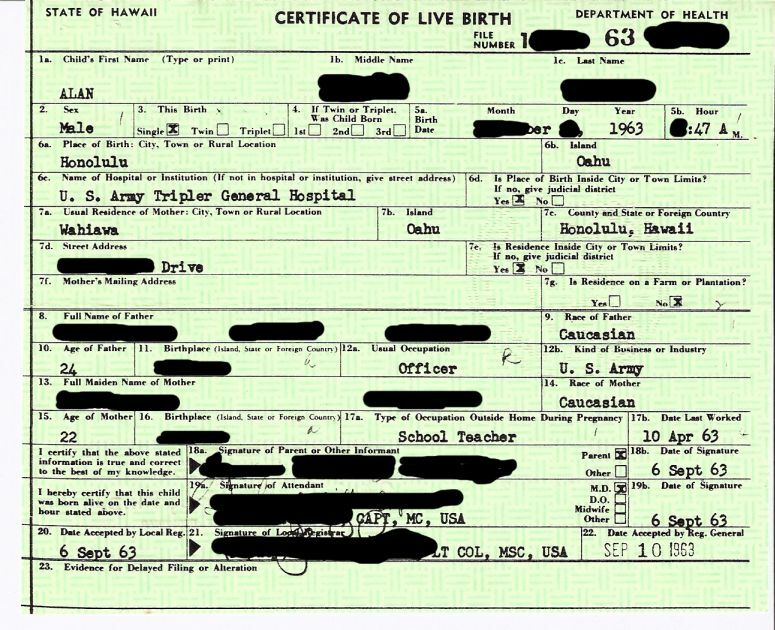 Next let's turn to the genuine Hawaiian birth certificate. It has much the same information that mine has. It's important to note the signatures, of which there are three. It is signed by a parent, an Army captain who is a member of the Medical Corps, and a lieutenant colonel. 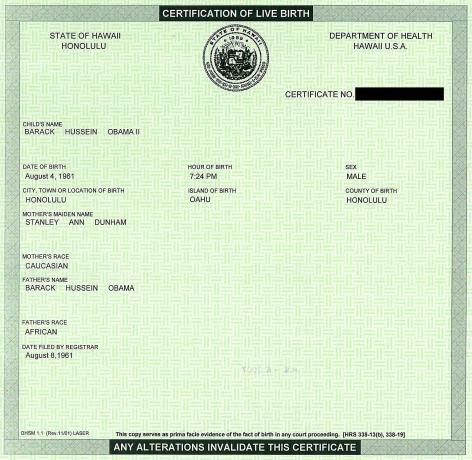 Finally we have Obama's "birth certificate." And what do we see here? We see a document without a single signature. Can such a paper ever be considered to be a "certificate" of any kind? What is needed for a document to be a legitimate certificate? What does the word itself mean? Ultimately the word comes from the Latin certus, meaning certain. The only way for the information presented on the document to be made certain is for one or more persons with knowledge of the facts to sign their names to the document. But the Obama document makes nothing certain about his birth. It is a piece of sophomoric tomfoolery that has no more probative value than a grocery list. These, then, are my answers to my correspondents. I hope that I have dispelled the two most important misrepresented facts: That Obama has submitted his birth certificate,and that the Supreme Court has ruled in his favor. Both are false. There is more that needs to be said, but I judge this to be enough bitter medicine for one dose.